The Phoenix Suns tipped-off against the Sacramento Kings on Saturday as the Kings opened up the game with an early five points. 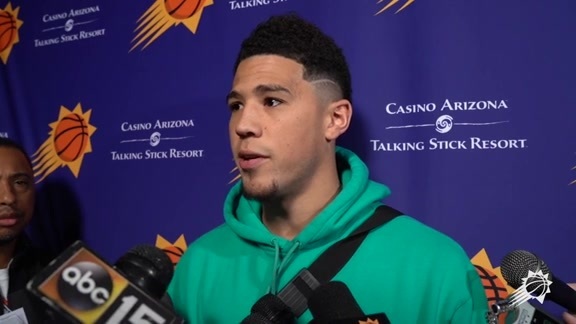 This was quickly matched and then exceeded by the Suns as Deandre Ayton and Devin Booker helped lead the team on a 19-0 run to put the Suns up by 14. The Kings battled back in the second quarter, going on a 13-0 run of their own, but the Suns managed to hold onto a six-point lead heading into halftime behind Booker’s 22 points. The Kings continued their second-quarter momentum into the third, outscoring the Suns by 10 as they took a four-point lead into the fourth. Troy Daniels and Elie Okobo hit back-to-back threes early in the final quarter to regain the lead for the Suns, but Bogdan Bogdanovic quickly responded to shift the score back in favor of the Kings. With under two-minutes remaining, Daniels blocked Marvin Bagley and found a sprinting Ayton up the court for the score to bring the Suns within four. That was the closest the Suns would get though as the Kings closed out the game strong in the final minute with a 112-103 victory over Phoenix. With his rookie-leading 37th double-double of the season, Deandre Ayton tied Alvan Adams for the most by a rookie in franchise history. This was Devin Booker’s sixth 30-point and 10-assist game of the season as he ties Kyrie Irving for the second most in the NBA behind only James Harden. Josh Jackson (right ankle sprain), Tyler Johnson (sore right knee), Kelly Oubre Jr. (left thumb sprain) and T.J. Warren (right ankle soreness) were all out. The Suns will continue their road trip as the team travels to Utah to tip-off against the Jazz on Monday. Be sure to catch the action on Fox Sports Arizona.